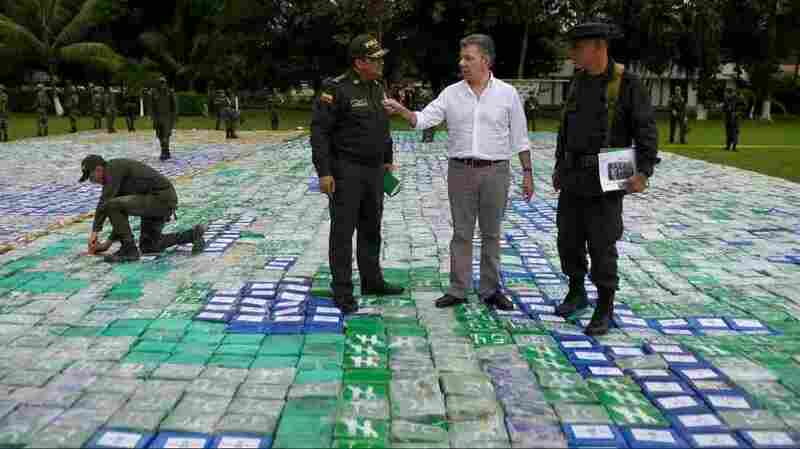 Colombia Reports A Historic Seizure Of Cocaine: More Than 13 Tons : The Two-Way The drugs are worth more than a third of a billion dollars, according to President Juan Manuel Santos. Colombian President Juan Manuel Santos‏ says the cocaine seizure on Wednesday is "the biggest in history." Colombia says it has made the biggest drug bust in its history, after seizing 13.4 tons of cocaine at farms northwest of Medellin on Wednesday. The drugs are worth more than a third of a billion dollars, according to President Juan Manuel Santos. Santos said the illegal merchandise, "valued at U.S. $360 million, belonged to the Clan of the Gulf and was seized in 4 collection centers in a radius of 6 km [3.7 miles], between the municipalities of Carepa and Chigorodó, Antioquia." With the bust from what officials have code-named Operation Agamemnon II, Colombia has now seized some 362 tons of cocaine so far this year, already eclipsing its 2016 total, Santos said. Police reportedly made four arrests connected to Wednesday's bust. The scale of the seizure is huge. Photos posted by Colombia's police show the drugs stacked in large plastic-wrapped bales in a shed. When police laid out the individual packets as a backdrop for Santos to announce the bust, it looked like a tiled plaza. The official tally of the seizure changed on Thursday. After initially reporting that 12 tons of "high purity" cocaine had been captured, the Ministry of National Defense said that the complete accounting found 13.4 tons. National Police Director General Jorge Nieto called it a "historic seizure in the fight against organized crime." The Clan of the Gulf is also known as the Gaitanista Self-Defense Forces of Colombia, or AGC, a paramilitary and drug trafficking outfit. According to the Tracking Terrorism site, the group "has been a long-time rival of both Revolutionary Armed Forces of Colombia (FARC) and Ejercito de Liberacion Nacional (ELN)." Colombia has seen a large spike in its cocaine production as a peace process has taken hold in recent years. To try to control that growth, Colombia has used cash incentives to get farmers to plant other crops. The government has also stepped up eradication efforts — as of this week, Defense Minister Luis Carlos Villegas said the government had forcibly eradicated 44,000 hectares (more than 108,000 acres) of illicit crops. As John Otis reported for NPR earlier this year, "Aerial fumigation briefly reduced Colombia's coca crop, but the spray planes were grounded in 2015 amid concerns that the herbicide might cause cancer." This summer, the U.N. Office on Drugs and Crime said that in Colombia, territories with coca cultivation increased by 52 percent last year — from 96,000 hectares in 2015 to 146,000 hectares in 2016. Citing the U.N. organization, Colombia Reports notes, Colombian coca farmers grew enough coca to produce more than 850 tons of cocaine in 2016.